I’m teaching AP Lit for the first time in about fifteen years this year. And I’ve started doing something that I never did in those years before: I’m doing the timed writings I ask of them. When they sit down to write, so do I. Under the same time restrictions, they and I both struggle to make sense of a dense passage or of an abstract poem or work to conjure up enough to say about a novel that we’ve read and discussed together. The first few I wrote were the poetry or passage analysis type of prompt. We all had the same text sitting in front of us, the same question to answer, the same blank sheets of lined paper, the same requirement for blue or black ink, the same chunk of time. I discovered that the task is really challenging, and even more challenging with the limited time. I discovered that my brain maybe works more complexly than it did when I was seventeen–good because I could find more to write about but bad because it was complicated and difficult to reign in concisely in about 45 minutes. The result of me writing with them was some first-hand knowledge of their experience and a better ability to coach them in my feedback as I read their work and talked with them as a class about how they all approached the analysis. But it was in the “question 3” style essay that we wrote where I really started to wonder why I had never written the timed essays with my students. I found a couple of prompts from the list of past AP Lit exam prompts that I thought would be fruitful for my students to write about Othello a few weeks ago as our ultimate culmination of our work with the text. We had a fruitful socratic seminar conversation the day before the timed writing, which is an excellent prewriting activity. My students have always struggled with clear theme statements that capture what they think a work of literature is asking of us as human beings, so as they spoke in the seminar, I made sure to point out the theme statements that naturally spilled out of the conversation. 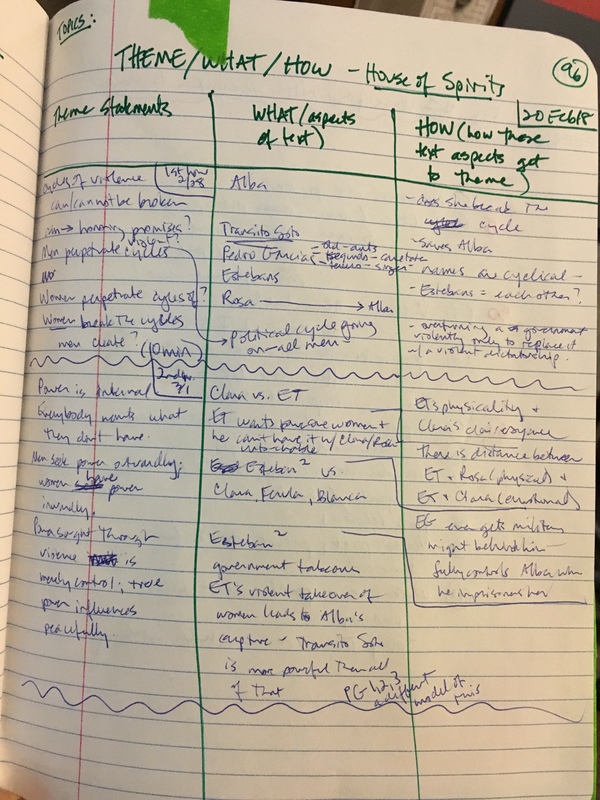 I encouraged students to list theme statements in their writer’s notebooks and think about which aspects of the text got to those themes–good prep, I thought, for the next day’s timed essay. And then I went home and spent my evening probably reading student papers and such per usual, not thinking anything of the timed writing task that was waiting for my students and me in class the next day. And I was woefully unprepared. I’m the teacher, right? I had all the text details in my head, right? Surely I was ready to write an awesome essay. Hmm. I struggled. Significantly. When I needed a clear, concise theme statement that lined up with the prompt I had chosen to write to, I couldn’t pull one forward in my head as readily as I needed to. I stumbled through the intro–it took me ten of my precious minutes to write it, and it came out of me in fits and spurts, many words crossed out along the way. By the end of the intro, I had a plan for the rest of the essay, but I struggled even more. I kept asking myself, “when exactly was that moment when Iago said________?” And “at what point of the play did Othello____________?” I had the generalities of the play at my fingertips, but the specific details I needed to write a well-supported interpretive analysis were nowhere available in my mind. It was so frustrating. Then I started to wonder how many of my students had had a similarly frustrating writing experience. I know the prep work I needed to do and didn’t do, but do they? Do they know what they should be doing to prepare for this kind of task? Had I not been writing timed writes with my students, I would not have seen–from inside the process of doing a timed write–that my students needed some additional instruction. The few minutes we spent on theme statements and related text details at the end of class discussions this past semester were time extremely well spent. Students reported that they felt prepared for the open question on the AP exam due to this work that we did. This entry was posted in #WorkshopWorksForAP, AP Lit, blog series, summer 2018 blog series, teaching writing, workshop teaching, writing with students. Bookmark the permalink. I love your desire to “write beside them”, and I’m sure your students take the timed writings much more seriously when you are struggling through the same writing with them! Great lesson learned, and great idea to have them put theme ideas in their notebooks every day! Thanks, Tracy! Writing with them has been so instructive.